Taken in the Vercors NP, France, on July 22nd 2018. The Large Tortoiseshell has orange-red wings with black and yellow spots and a dark brown edge. The dark border of the hind wings is decorated with dark blue lunulae. The underside is greyish brown. The sexes are similar. It can be found in most of Europe, northern Africa, and western Asia. It became extinct in the British Isles in the 1960s. The reason for this is unknown. Typical habitats are light mixed woodland, forest edges and clearings, also parks and gardens. There is mostly one generation per year, in July and August. The adults hibernate and re-appear from March to early June. Elm, Sallow, Pear, Cherry, Plum and other trees are used as foodplants. Tree sap and fermenting fruit are particularly popular sources of nutrients. 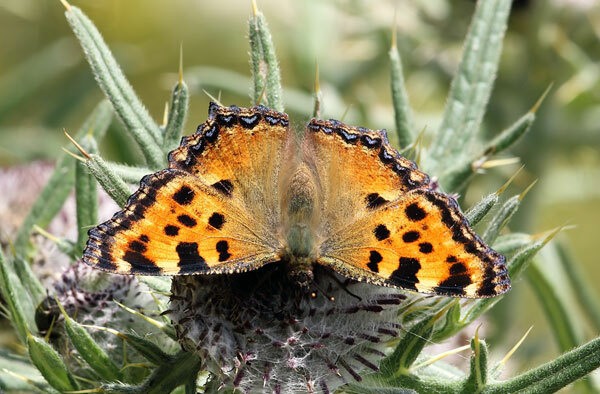 Like other nymphalids, Large Tortoiseshells migrate steadily throughout their lives, alternating cross-country travel with periods of egg-laying, feeding and basking.